The Biddeford Heated Throw is a super luxurious throw blanket that is perfect for snuggling up on the couch or for heating up your legs while working at a desk. 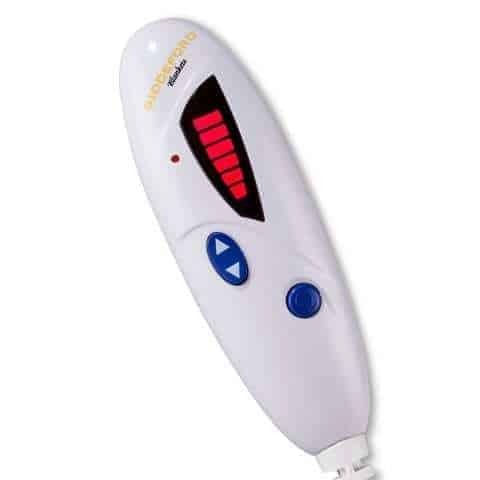 It is smaller than a regular size electric blanket, but it is larger than most throws on the market (50 X 62 inches, instead of 50 X 60 inches), so it is perfect for one person or 2 depending on how you use it. The stand out feature of this throw is the material it is made out of. On one side you have a soft and cozy faux shearling backing with the Mink fabric on the other. The shearling is always white, while the mink side comes in a wide range of different colors (Chocolate, Lavender, Linen, Gray, Spice, Red Plaid, Tan, and Hounds tooth. Bed, Bath and Beyond and Target have the most selection of colors). Another feature that make it unique is that it has 6 heat settings, which is actually usual for a throw, the standard amount is 3. So you can customize the heat level to your preferred setting. It also has an extra-long 10-hour automatic shut off for added safety (standard for throws is a 3 hour shutoff). As well as a long 13 foot power cord allows you to snuggle with your throw in any room. It is easy to wash and dry and comes with a 5 year warranty. It is one of the more expensive throws around, but you are paying for the fabric. Sunbeam have a similar mink/sherpa throw, if you prefer that brand, although it is a little more expensive than the Biddeford (and it doesn’t have the (6 heat levels, the longer cord for the wall or the 10 hour shutoff). The fabric/material is obviously the big feature that most customers love. The faux mink is described as being super soft and the sherpa side is also very soft and cuddly. Another thing that people really love is that it is a larger size than most throws, it is only a couple of inches bigger but customers who are tall especially seem to like this throw because it covers their feet. Since it is a throw, you can use this while working at a desk or have it out on the couch. When you are shopping for this type of blanket you want to get a product that is comfortable but one that also looks good if you are going to be using it in a common area of the house. Most reviewers agree this one looks great and you won’t have to worry about getting it out of site if anyone comes over. Generally people are finding that this model heats up quickly and is able to hold the heat. It functions and wears as you would expect from this type of product in this price range. The controller is large and easy to use and partly because of the big size. Some users report that the heating is a little uneven. It isn’t clear whether this is just due to certain faulty blankest or a general problem with the product. Obviously everyone will have different sensitive to heat, so it just might be that it isn’t right for people who want a product that gets really hot. There are also a few complaints about the control cord being too short (cord from the blanket to the control) while the cord from the blanket to the wall is nice and long. This means that the control tends to be a little too close to your face, so you would have to do some maneuvering to adjust that. There are some scattered reports that you can feel the wires, but the softness of the blanket cancel out the feel of the wires so it isn’t a deal breaker. A few reviewers report that it doesn’t warm up enough, although again this may be due to a defect in the product. There are a couple of minor complaints about the control display, as the controller has a digital display that lights up red bars showing if the blanket is on. The background is black so if you happen to be red/green colorblind you may have difficulty seeing the red indicator lights. Most people will be very happy with this product; it would make a great gift for almost anyone or just a nice gift to treat yourself to something cozy and luxurious. If you are specifically looking for a blanket for someone who is tall this would work very well, since it is bigger than other throws. It is also pretty nice looking, so if you are someone who is particular about your decor, you can get this in a number of colors. It looks very good and won’t stand out. Pets love this blanket, especially cats, but as you probably already know you need to keep your pets off heated blankets because they could do damage to the product or to themselves. If you are looking for a throw with a longer shut off time than the standard three hours, this is a great one to look at. Or if you need a throw with a very long cord from the blanket to the wall this is a wonderful option.